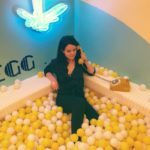 When it comes to creating road trips for you lovely readers of Only In New York, I often struggle with picking one region to hone in on. With a state as large as ours, it’s needless to say that there’s so much to see and do. 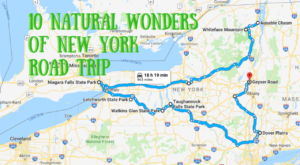 In order to cover all the bases and showcase some of the most stunning parts of New York’s Great Outdoors, I’ve created two sets of road trips below. 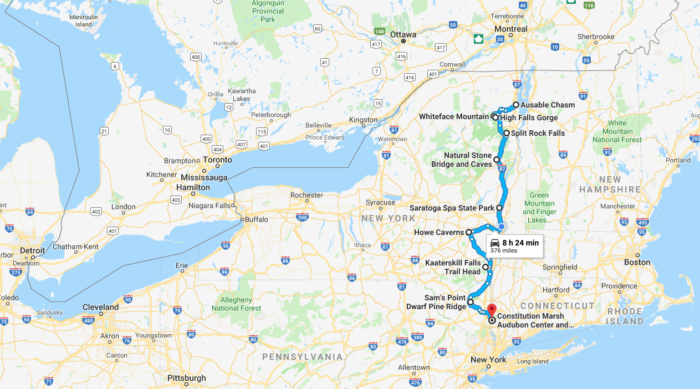 The first road trip falls in the eastern half of our state, taking you from up in the Adirondacks to down along the Shawangunk Ridge. 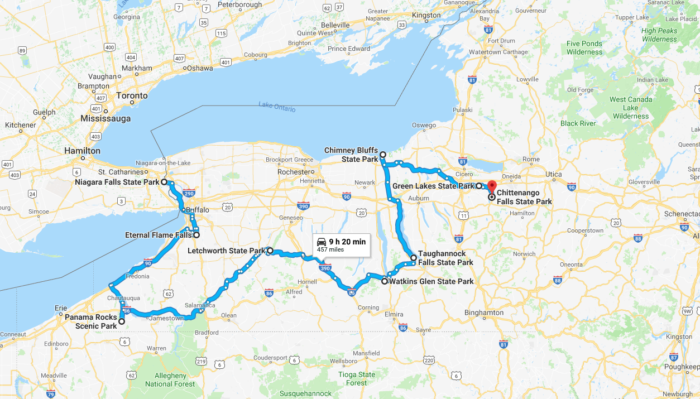 While the second road trip you’ll find falls in our western half, starting out in Niagara Falls and bringing you to Central New York. Ready for an adventure? Keep scrolling to see which one of the road trips is most suitable for you! To view the entire interactive map of this road trip on Google, click here. First stop, America's Oldest Natural Attraction - Ausable Chasm. 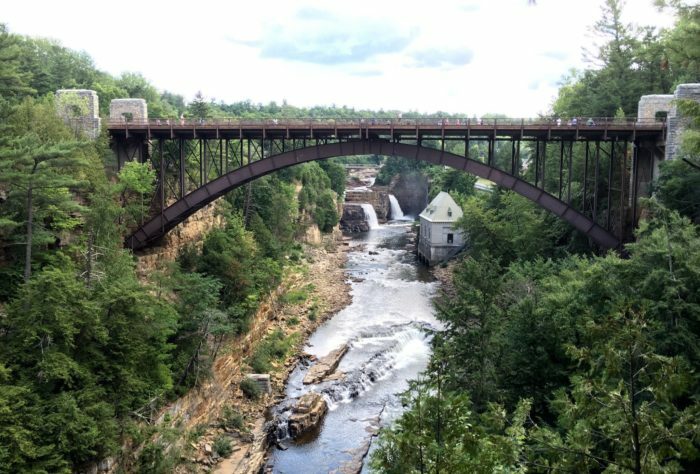 Located up in Keeseville, Ausable Chasm is the oldest natural attraction in our country. 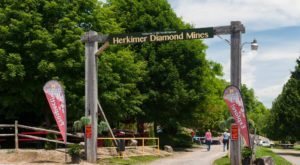 Giving you both a taste of history and adventure, at this amazing attraction you can enjoy everything from hiking and camping to rock climbing and float tours. Next, pay a visit to the 5th tallest mountain in New York - Whiteface Mountain. Hiking up any of our Adirondack Mountains is an adventure that's worth taking, but Whiteface Mountain specifically has some perks... and dreamy views! The 5th tallest mountain in our state, not only can you hike your way up to the summit but you can also drive. 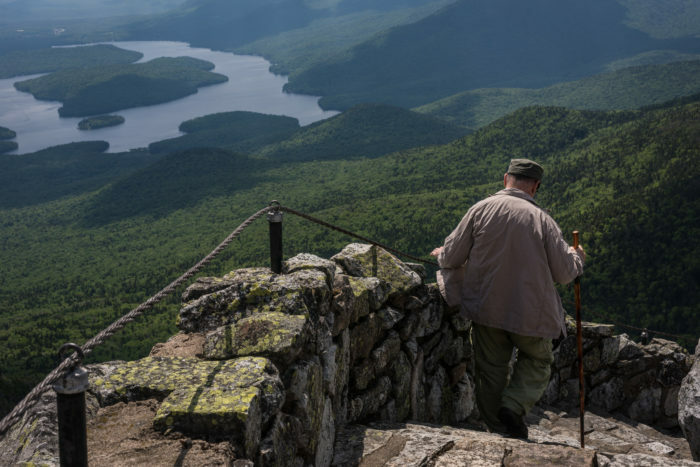 So whether you want to get a workout and cross another High Peak off of your bucket list or you're looking to take a family adventure that involves a scenic drive and gorgeous views of Lake Placid, this mountain is for you. Afterwards head to High Falls Gorge. 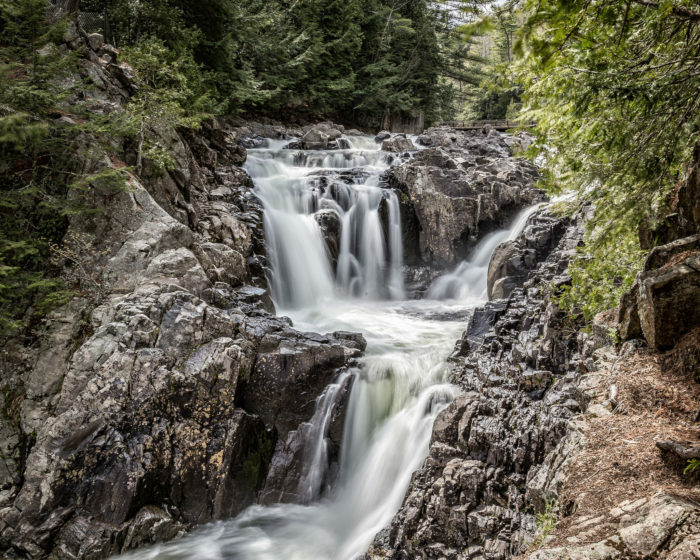 Hiding all over the Adirondacks, you can find plenty of waterfalls that will leave you in awe. But at this one private park up north, you can get the chance to see four Adirondack waterfalls in a unique way like never before. 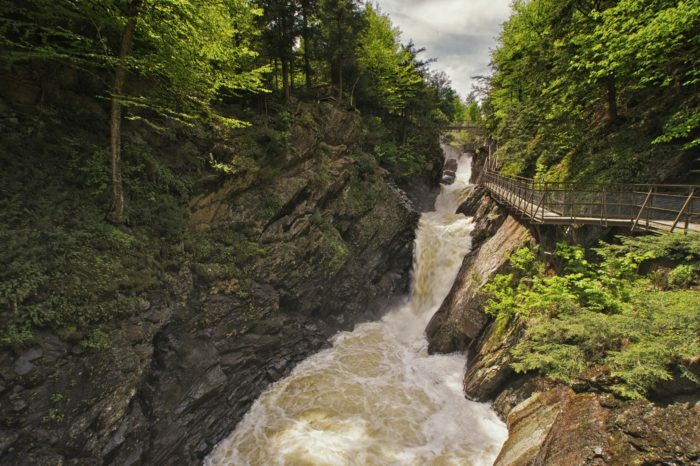 Hike through the woods and along boardwalks that cling to the walls of this northern gorge. One of the most exciting parts? Pieces of the bridges even feature glass floors that allow you to see all the way below! Cool off in one of our favorite natural pools at the base of Split Rock Falls. A popular spot to go cliff jumping and swimming, Split Rock Falls in Elizabethtown is wonderful to check out even if you're only interested in the view. Flowing down and forming a pool of emerald water at the base, this Adirondack waterfall is roughly 100-feet in size when you add up its cascading falls. 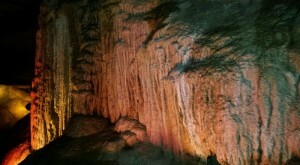 Visit the largest marble cave entrance in the Eastern U.S. at Natural Stone Bridge and Caves. 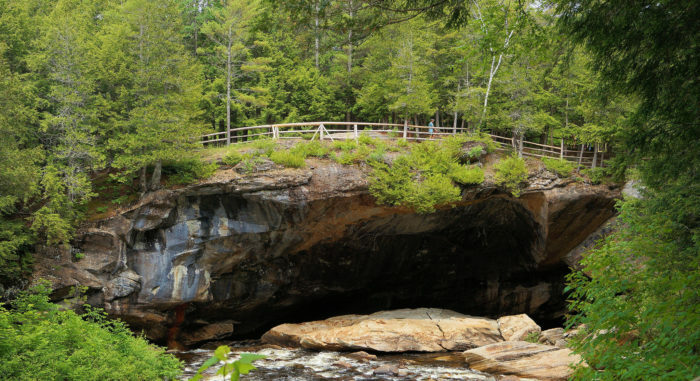 Up north in Pottersville, New York's Natural Stone Bridge and Caves gives visitors the chance to explore one of the largest cave openings in our country. Open all throughout the year, the scenery here looks magnificent no matter what season you visit. 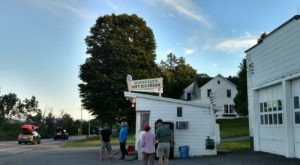 While we try not to have favorites, we can't help but love coming here during the summer when their ice cream stand is also open out front! Head down to New York's only geyser at Saratoga Spa State Park. A beautiful outdoor attraction of Saratoga Springs, Saratoga Spa State Park has more to offer visitors than your average state park. 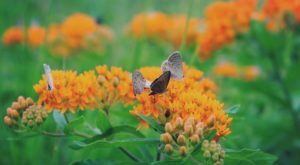 This state park features everything from our state's only geyser and an outdoor performing arts center to museums, pools, a golf course and plenty of hiking trails. Head underground and explore the famous Howe Caverns. New York's most well-known cave, over 150-feet below the surface you can find an entire underground world here at Howe Caverns. 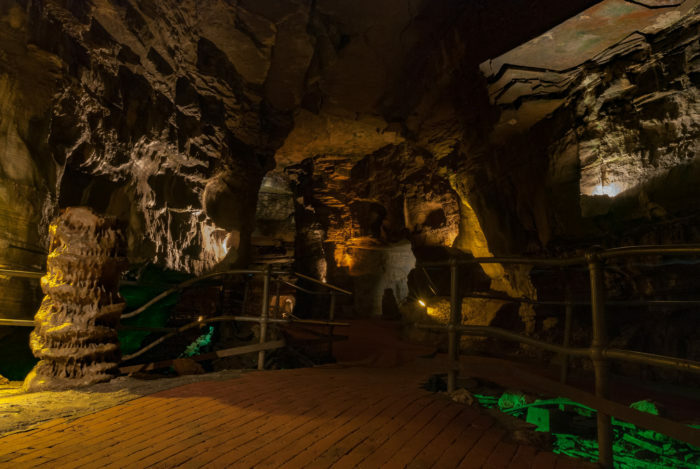 While taking a cave tour at Howe Caverns you'll not only get to explore this hidden wonder of our state, but you'll also get to enjoy an underground boat ride as well! Visit the most extraordinary waterfall in the Northern Catskills - Kaaterskill Falls. One of the tallest waterfalls in New York, Kaaterskill Falls is known for both its beauty and its danger. 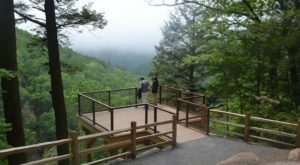 The two-teir waterfall has a variety of ways for explorers to enjoy its view, with a viewing platform at the very top of the falls and a short half-mile trail off of Route 23A that leads you to the base of the falls. Word of advice? Stay on the trail. 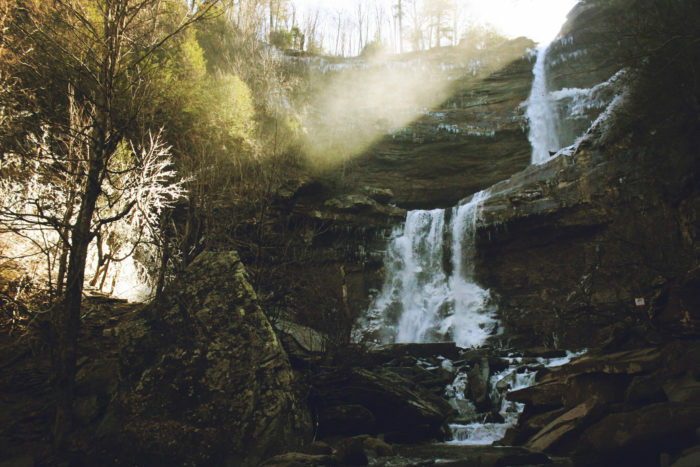 The deaths that have occurred in the past at Kaaterskill Falls have almost always been a result of going off trail and getting to close to the waterfall's ledge. 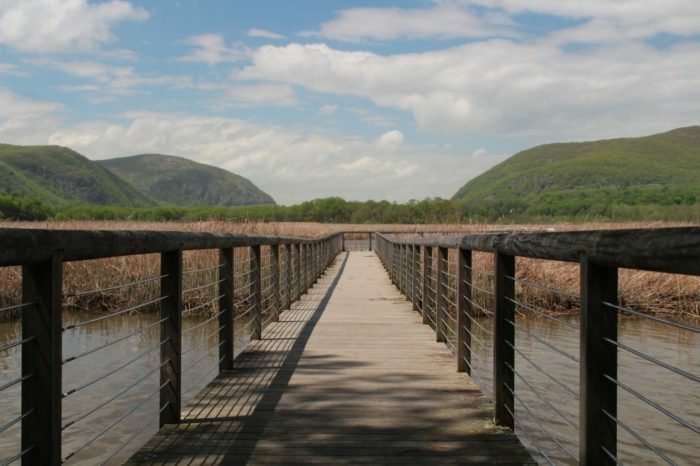 Explore the Hudson Highlands while you hike at the Constitution Marsh. 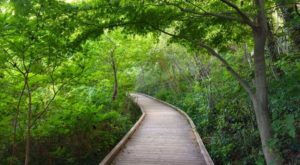 A hike that most consider to be easy, this roughly mile long trail will lead you out into a gorgeous marsh. At the end of the trail you'll be greeted by a 700-foot long boardwalk that takes into the marsh and makes for a wonderful wildlife watching destination. Bonus? 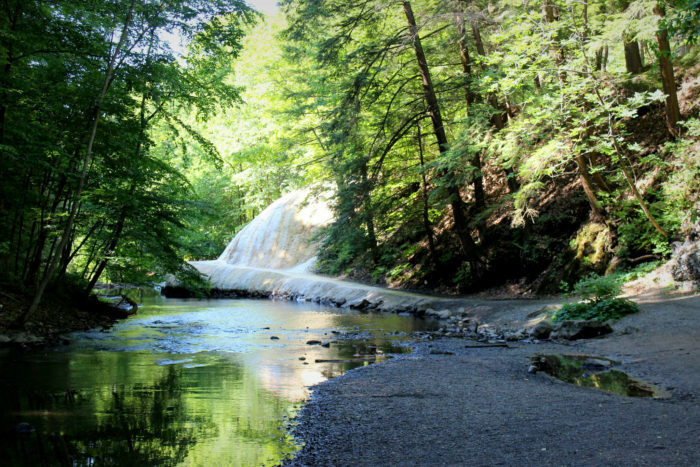 Just down the road you can also find Indian Brook Falls! Last but not least, you'll need to visit Sam's Point Preserve. Part of the Minnewaska State Park Preserve, Sam's Point is a over 4,000 acre preserve that has everything from magnificent hiking trails to actual ice caves that you can go into and explore. 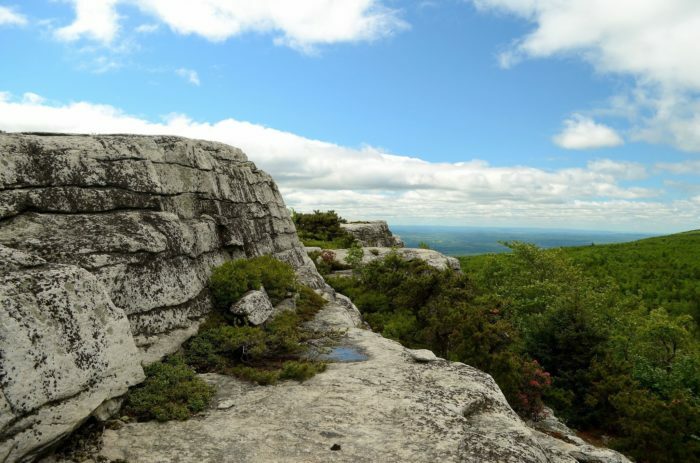 Situated on the Shawangunk Ridge in Cragsmoor, you'll feel like you're on top of the world while you're hiking around Sam's Point Preserve. First top, America's oldest state park - Niagara Falls. The most grand waterfall in all of New York, Niagara Falls is visited by millions of people from all over the world each and every year. 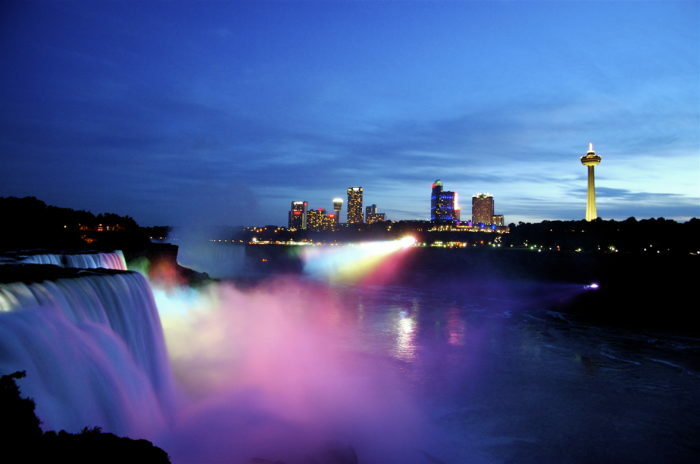 Open 24 hours a day, the state park transforms at night when the falls are light up for all to see. From rides on the Maid of the Mist to walking out on the Observation Tower, this is one thrill adventure to take. Hike to the only New York waterfall with a burning flame inside of it - Eternal Flame Falls. 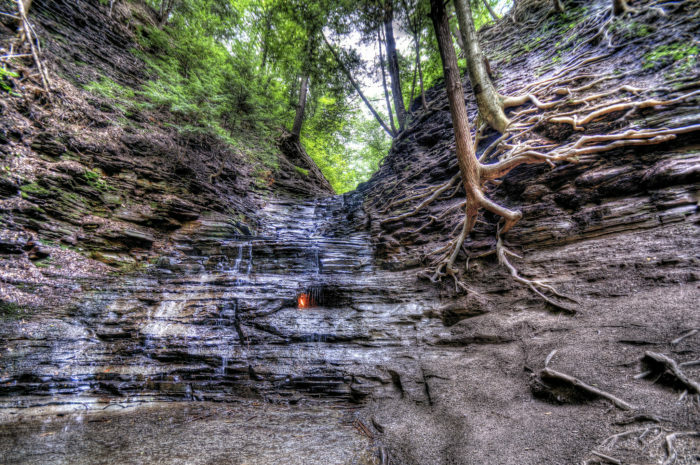 While this may sound like a mythical natural wonder, Eternal Flame Falls is exactly as it sounds. The waterfall features a burning flame inside of it that stays lit throughout the year, very rarely ever dimming out. So how did this flame come to be? Natural gas is emitted, making it so anyone who sparks up a flame can ignite this fire within a New York waterfall. Head on over to our favorite rock park - Panama Rocks Scenic Park. Around New York and especially out in this region, you can find quite a few rock parks that will transport you to another world. 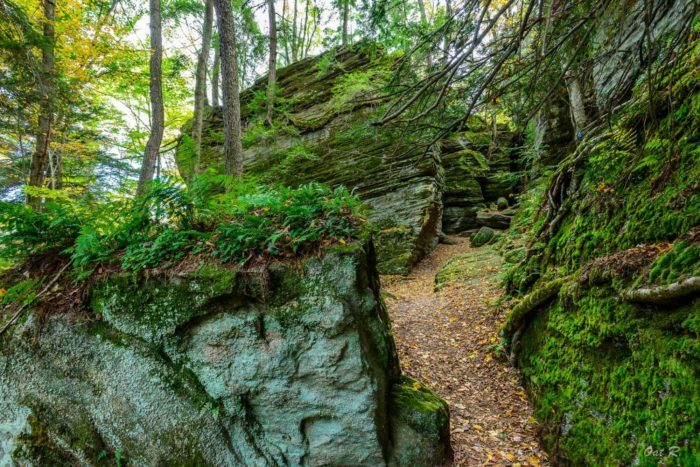 Full of green moss and large rocks that will tower above you, Panama Rocks Scenic Park is tucked away in Chautauqua County. The scenic park is full of rock formations that date back to hundreds of millions of years ago, with a one-mile hiking trail that will take you through amazing passageways. Check out the Grand Canyon of the East - Letchworth State Park. Recognized for being one of the best state parks in the country, Letchworth State Park in Castile is the perfect place for any true adventurer to go and explore. Throughout the large state park you'll find handfuls of waterfalls, with the most famous three falling along the Genesee River. If you're looking for an unforgettable hiking destination, you don't need to look any further! Explore one of the most beautiful places in New York - Watkins Glen State Park. 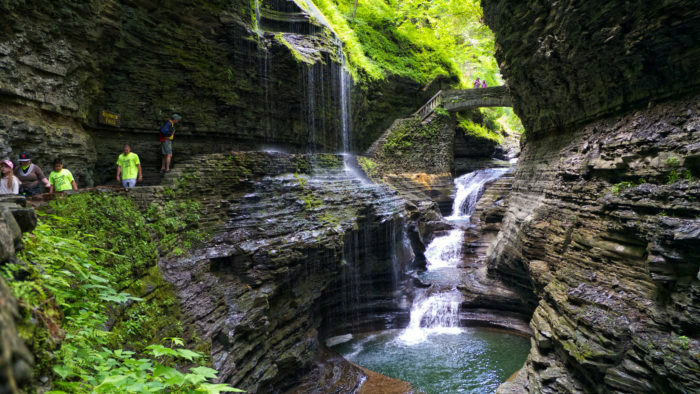 Inside Watkins Glen State Park you can find a 2-mile long Gorge Trail that allows you to see nearly 20 waterfalls. Sounding too good to be true, those who decide to explore Watkins Glen will get to walk behind and underneath enchanting waterfalls. 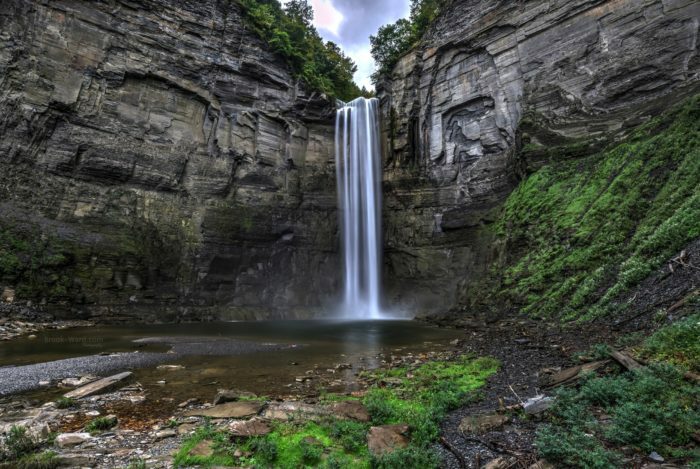 See the tallest free-falling waterfall east of the Mississippi River - Taughannock Falls State Park. Just outside of Ithaca, Taughannocak Falls State Park is 215-feet tall. 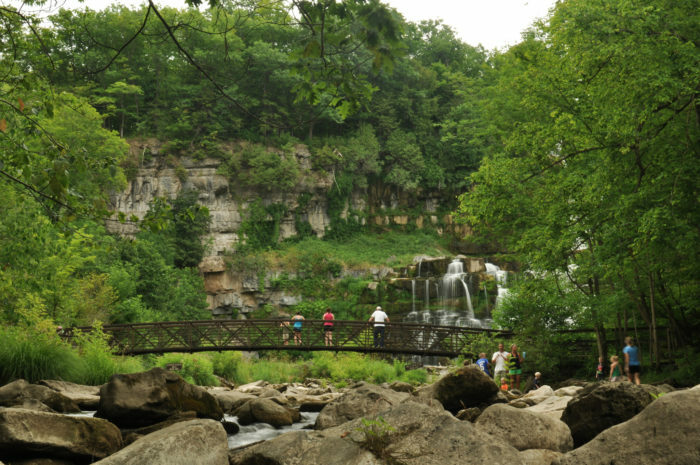 The state park features several hiking trails, with an easily accessible overlook area that gives you a picturesque view of the falls. 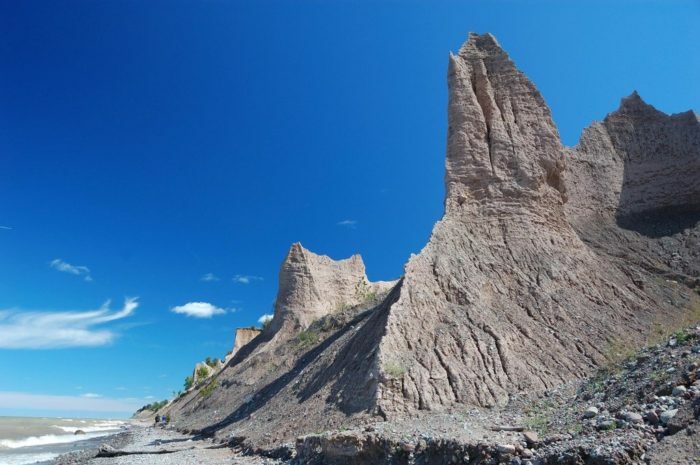 A nearly 600-acre state park, New York's Chimney Bluffs have experienced significant erosion over the years but still maintain their glorious beauty. The park has its own one-mile long trail that takes you out along the bluffs and gives you a marvelous waterfront view the whole way. Explore some of the only meromictic lakes in the world at Green Lakes State Park. New York has quite a few lakes that are known for their colorful water, but there aren't too many lakes in the world that are like the two that you'll find at Green Lakes State Park. Green Lake doesn't experience any turnover, creating crystal clear water that's as vibrant as the waters you would find in the Caribbean. And it wouldn't be a New York road trip if it didn't end with a waterfall! An easy waterfall to access, the hardest part about getting a view of Chittenango Falls is making your way down the state park's set of stairs. After making your way down the stairs, you'll find yourself at the base of a waterfall that stands tall at over 160-feet! Tell us in the comments which road trip you would prefer to take! 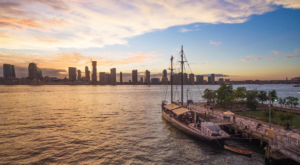 To explore more beautiful places around our state, read about This Little Slice Of Heaven Right Here In New York That You’ll Want To Visit.